The Vishnu Chakra or Sudarshana Chakra is a spinning disc like weapon with 108 serrated edges used by the Hindu God Vishnu. It is considered to be one of the most powerful weapons in Hindu mythology. The Sudarshana Chakra is generally portrayed on the right rear hand of the four hands of Vishnu. Sudarshana Chakra is embossed with vyali base over a lotus pedestal. 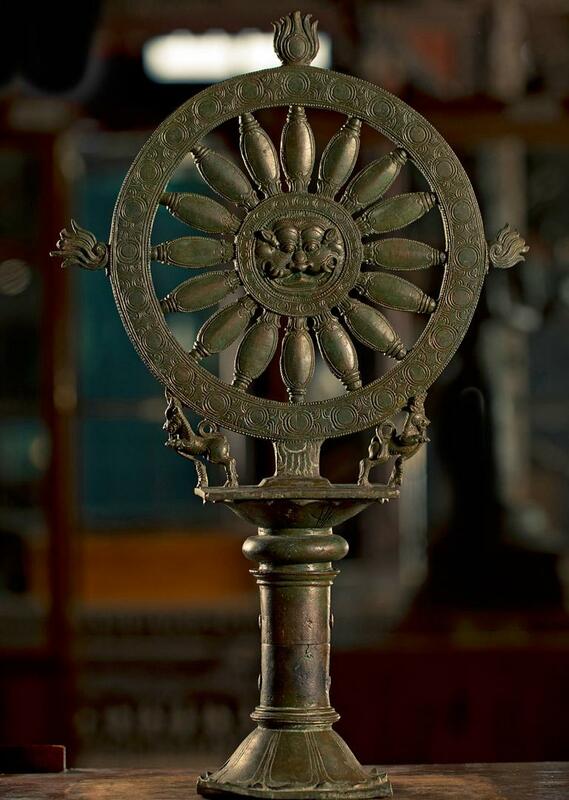 Front has the vyali mugha with 16 spokes and the rear is embossed lotus bud decoration. Lord Vishnu also holds a shankha (conch), gada and a padma (lotus).